A number of different agents may cause swellings on the legs and feet of wild birds. Some of these are caused by mites of the genus Knemidocoptes and result in scaly legs. The 'scales' themselves are dry encrustations made up of material produced by the bird in response to the irritation caused by the mites, together with skin debris thrown up by the mites as they burrow into the tissues. As well as forming on the legs, the 'scales' may also form around the beak. These mites are members of a wider family of mites that cause mange in domestic animals and scabies in humans. 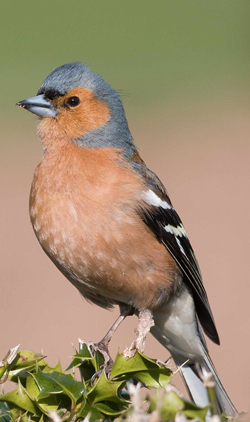 Another cause of warty growths is the Fringilla papillomavirus which affects Chaffinches and Bramblings. These growths may vary in size from small nodules to larger warts that engulf the whole leg. The warts develop slowly over a long period and affected individuals may otherwise appear quite healthy. Some individuals may become lame or lose affected digits. Wounds on the feet may become infected by bacteria, resulting in the formation of abscesses - sometimes referred as 'bumblefoot' by poultry breeders.